Adjusting hot water heater temperature settings is something you can do for both gas and electric water heaters. The critical question is, 'How Wise Is It? ', the factory settings are at a safe level. The main reason that you would consider this is to get more hot water. It is possible that you need more hot water or you may have a malfunctioning hot water heater that is not yielding as much hot water as it should. In both situations, raising the water temperature is a poor idea. If something needs to be fixed on the hot water heater it would be wiser to fix it. See the articles 'Troubleshooting Gas Hot Water Heater Problems' and 'Electric Hot Water Heater Troubleshooting' for a list of issues related to too little hot water. Both of these articles have several questions that are related to hot water quantity problems. Not sure what type your water heater is? Some tips on how to identify your particular type of water heater are found in the articles 'How To Shut Down a Gas Water Heater' and 'Shutting Down an Electric Water Heater'. So how dangerous is hot water? At 160 degrees water can cause a second or third degree burn in a half of a second. Do you have children, elderly, infirm or handicapped individuals in your home? Caution needs to be exercised. The 'Accurate Building Inspectors' website has a page with a great visual graph that shows how dramatically the chances of burns are increased when the water temperature is increased. Water that is too hot can cause serious injury even death. This website has statistics that shot that more than thirty people die and nearly four thousand people are injured each year from hot water related burns. Most water heaters are set at the factory for 120 degree hot water. Even at this setting, the water can feel pretty hot when there is no cold water mixed in. Who Uses Straight Hot Water? This is a valid argument. You always mix hot water with cold water for most things like showers, the dishes, etc.... So, as long as you are paying attention, you can adjust the temperature by using cold water. Seems like a perfect solution. However, as noted above, it is possible to make a mistake and turn the water on full hot accidentally and this could result in serious injury. I have the water heater set to the factory settings in my home. At our kitchen sink we have a single lever faucet that is fairly touchy. I have to say even at normal factor settings the water is often too hot to leave your hand there for more than a second or so. At a hotter temperature, I am sure I would have been burned more than once. You may be thinking that raising the temperature is and easy way to get more hot water. In theory it is, but there are consequences. Have you made sure that your hot water heater is working properly? See the article Gas Hot Water Heater Troubleshooting for tips on what to do if you don't have enough hot water. It is also possible that you are asking more of your water heater than is reasonable. See 'Gas Water Heater Tank Size' for information on the proper sizing of a hot water tank. Don't blame your gas water heater thermostat if you tank is too small. Actually changing the setting is simple. You will find a dial on the front of your gas valve. Turn it toward 'Hotter' or the higher temperature to increase the temperature. Check you owner's manual for the recommended setting. It is most likely 120 degrees. There is usually a mark on the dial for the suggested setting. The danger factor goes up exponentially for each ten degree increase. WARNING!! Hot Water Can Cause Severe Burns! Be Careful! 120 Degrees is the Suggested Setting!!! WARNING!!! Of course it is possible to change the water heater settings on your hot water heater. If you think the setting is too high, you may need to lower it. So if you need to change the settings it is not that difficult. If you intend to raise the temperature, do so with caution. On a gas hot water heater the temperature dial is on the gas valve at the bottom of the water heater. All you have to do is turn it to make an adjustment. Most heater have a hatch at the factory setting and they may say something like 'Warm' and 'Hot' to give you the sense of which way to go. It is best not to deviate too far from that mark. If the temperature had been set higher by someone else, lower it back to the factory setting. If you are raising it, BE CAREFUL. On an electric hot water heater, changing the temperature is more difficult. 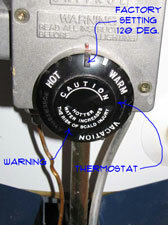 Most electric hot water heaters have two thermostats, on the thermostats there is a temperature setting dial. Similar to the gas water heater there is a mark for the factory setting. The bad news is that the the thermostats are not exposed. They are behind access panels. To safely access them, you should shut the power off for the water heater. See the article 'Shutting Down an Electric Water Heater', for instructions on safely shutting off the power. With the power shut off you need to remove the access panels. Your water heater has two thermostats, therefore, two temperature dials. The panels are located on the side of the hot water heater. One will be in the lower third of the unit and the other will be close to the upper third. There may be a layer of insulation that conceals the thermostat from view. Carefully move the insulation aside. The temperature adjustment will be toward the bottom of the thermostat. It may say something like 'Hot' and 'Very Hot', or it may have the degrees listed. 'Hot' will normally be the factory setting or the degrees should be around 120. Try and stay as close to the factory setting as you can. See above for the dangers of setting it too high. Need More Hot Water Heater? There are things that could be wrong with your hot water heater that will cause the amount of hot water to be reduced. For a general discussion on issues with hot water see the articles 'How To Troubleshoot a Gas Hot Water Heater' and 'Troubleshooting Electric Water Heater Problems'. Several of the topics covered discuss a lack of hot water. Do you have an electric hot water heater? Most electric hot water heaters have two heating elements. If one of them fails, you will still have hot water but a lot less than you should. See the article 'Checking Hot Water Heater Elements' for instructions on how to test them. Another factor that can reduce the amount of hot water is a sediment build up in the bottom of the tank. This is especially true of older hot water heaters. See the article 'How To Remove Water Heater Sediment' for more information. Another less likely problem could be your dip tube. Sure we understand, you probably didn't realize that you had a dip tube, let alone that it could be a problem. It is a feature in a hot water heater that directs the cold water into the bottom of the tank. Over time this tube can disintergrate, causing the cold water to cold water to be introduced into the top of the tank. Yes it will sink in time, but until it does the thermostats will not realize the need to heat the water. This inefficiency reduces the amount of available hot water. See the article 'How To Replace a Dip Tube' for more information. There are many reasons why you might need to consider replacing your hot water heater. One big one, would be changes in need. When the size of a household increases this may put strain on a hot water heater. If the water heater is too small for the size of the household, there will be problems.